"In the opening pages of the Book of Mormon a journey from Jerusalem is recorded by the family of a man named Lehi. The book gives a fairly descriptive account of geography found in their journey south from Jerusalem. The journey is recorded in the 1st book of Nephi chapter 2 (which reads the same on pages 7 and 8 in a first edition copy). According to the book the family travels to the Red Sea. From there the family then travels for three days to a valley in which the family establishes a camp. The account is descriptive enough to identify that this valley contains a river of water that empties into the Red Sea and the valley is close to the shore of the sea where the mouth of the river is. The family stays here long enough to send their sons back into Jerusalem several times before departing for the remainder of their journey. The father of the family also takes the time to build an altar here. In 1830 when the Book of Mormon was published, topographical maps were just in their infancy. France and India were the only two countries that had any topographical charts started before 1830. Atlas's from the early 1800's show country boundaries in Arabia but topography is limited to mountain ranges drawn as multiple mounds on the map. Very few maps identify any mountains or mounds within three days distance from the top of the Red Sea. Finding both a valley and a river within this range on these maps is even more difficult. Modern satellite imagery allows us to identify geographic features much easier now. If the family of Lehi had travelled for three days at the standard walking rate between 2 to 3 mph, this means that during the shortest daylight time in Arabia where sunlight is only available for 10 hours a day, the family would have walked between 60 to 90 miles. The distance would be less due to time needed to set up and break down camp, and to stop to eat, but more if they were travelling sometime other than the winter solstice. The ancient route from Jerusalem to the Red Sea ends at ruins located on the outskirts of modern day Aqaba. Located at 28.563416 N and 34.808121 E, about 75 miles south of Aqaba, is a deep valley that cuts into the mountains which are almost directly on the shore of the Red Sea. This valley contains a river that empties directly into the sea. In addition, according to captions of the photographs provided by Google Maps as of 8/24/12, there is also a shrine within this canyon. Often the question is asked why the valley does not have the name on our modern maps that Lehi identified them with. Those who ask this question have not read the book because the book clearly identifies that all the people that travelled with Lehi ended up in the Americas. The man did not leave directions or name plaques behind for those he thought were going to destroy Jerusalem. Another good question is why is this geographic information is included in the Book of Mormon in the first place? The inclusion of geographic data is not necessary for the Book of Mormon to make its spiritual point. Why would this information be included if someone was attempting to pass off fiction as fact? It would stand in the best interest of an author who is attempting to do so to leave the locales and geography as vague as possible unless the author had actually been there. Contrary to this notion the Book of Mormon has descriptive geography, travelling durations, and place names of locales that were claimed to already be present." In the opening pages of the Book of Mormon a journey is recorded by the family of a man named Lehi. The book gives a fairly descriptive account of geography found in their journey south from Jerusalem. The first major stop is recorded to be in a valley three days south from where the group initially arrives at the Red Sea. "And it came to pass that he departed into the wilderness. And he left his house, and the land of his inheritance, and his gold, and his silver, and his precious things, and took nothing with him, save it were his family, and provisions, and tents, and departed into the wilderness." "And he came down by the borders near the shore of the Red Sea; and he traveled in the wilderness in the borders which are nearer the Red Sea; and he did travel in the wilderness with his family, […]"
"And it came to pass that when he had traveled three days in the wilderness, he pitched his tent in a valley by the side of a river of water." "And it came to pass that he built an altar of stones, and made an offering unto the Lord, and gave thanks unto the Lord our God." "And it came to pass that he called the name of the river, Laman, and it emptied into the Red Sea; and the valley was in the borders near the mouth thereof." "And it came to pass that my father did speak unto them in the valley of Lemuel, [...]"
All emphasis in the above verses are my own. The Book of Mormon was published in 1830. The majority of maps at the time identified most of Arabia as a desert, with the exception of cities near the water. While these maps identified the boundaries of countries, their topology had much to be desired. Mountains were drawn on the map as a series of mounds. Very few maps identify any mountains or mounds near the top of the Red Sea. Finding a river within this range on these maps is even more difficult. Turquie d'Asie, Perse, Afghanistan, Arabie: A map of Arabia from the Atlas universel de geographie ancienne et moderne which was published in 1833. Determining where mountains, cliffs, rivers and valleys existed would have been a particular challenge to anyone at the time. Topographical maps that clearly defined valleys and hills were still in their infancy. At the time the only complete topographical map of a country was France. India was partially mapped but would not be completed until 30 years after the Book of Mormon was published. The only other topology maps that existed in the 1800's were started well after the Book of Mormon was published. These were for Cambodia, Laos, and Vietnam. All other topology maps were created after the turn of the next century. To identify the existence of a valley with a flowing river in a desert at three days walking distance of specific point would be nigh on impossible in 1830 without experiencing it first hand. They would also need to be more observant than the map makers that had preceded them. Modern technology has changed our maps. Now we have cameras flying through the sky that can take pictures so close to the ground that you see someone's balding pattern. This allows us to identify geographic features much easier now. In addition to that people can now share pictures of locations from the world over in an instant. So what is at three days journey down the shores of the Red Sea? The ancient route to the Red Sea from Jerusalem would take the family southeast, past the Dead Sea then south-southwest to the shores of the Red Sea. Today the family would arrive at the modern city of Aqaba. The city that the family would arrive at in their time now sits as ruins in Aqaba's outskirts. The standard walking rate for a human being is around 3 mph; 3.5 if they are moving briskly and of course less than 3 mph if they are moving slower. Using the minimum amount of sunlight available in the Arabian sky during any given day (which is at the winter solstice), the family would have a minimum of 10 hours of daylight with which to travel. So if the family was moving between 2 to 3 mph the family could travel between 20 and 30 miles in a single day. Over a period of three days this would be between 60 and 90 miles that they could have travelled. There are other variables that would affect this result. The family would be delayed because of the need to set up and break camp; however the family would also have more time in the day if they were travelling at some other time than during the winter solstice. About 75 miles from Aqaba, right between our 60 to 90 mile estimate, lies a fissure in the mountains. It can be found on a map at 28.563416 degrees north and 34.808121 degrees east. This valley has a river that runs through it that provides enough water to grow palm trees. In the screenshot below, you can see it just as it appears on Google Maps on August 21st, 2012. Notice that I have the photos feature turned on so you can clearly see the fissure and the palm trees that grow in and at the mouth of the canyon, where the river meets the Red Sea. Additional notable images of the ravine and its water supply can be found here, here, and here. Now what I find really interesting about this picture isn't necessarily that there is actually a valley in the desert with a river running through it at three days walking distance from the top of the Red Sea. What I find really interesting about this screenshot are the captions provided by a local photographer about what's in the valley. A screenshot of Google Maps from January 7th, 2014 at the latitude and longitude of 28.563416, 34.808121, zoomed into a value of 16, with the tiny Panoramio image just to the top right of the arrow selected. A closer look at the same coordinates on the map will reveal that there is a decent amount of water that can travel through this canyon. Some of the more predisposed may argue that this stream does not match their definition of what a river is. From Hebrew, however, almost every word that would have been translated into the English word river in the Book of Mormon would also be synonymous with a smaller flow of water. 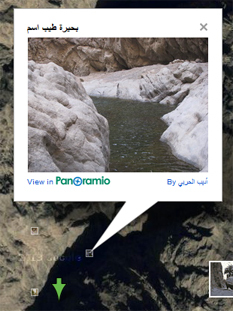 The most appropriate word is נַחַל which is synonymous with river, stream, brook, or wadi (valley with a stream). Also just as common is נָהָר which simply means either river or stream. There is one additional word that can translate into river in English, but it much less common. It is יְאוֹר which can mean river or water course, however, it is more properly used as the name for the Nile. So why don't locals call this valley "the valley of Lemuel" or the river "the river of Laman?" For some reason, critics of the Book of Mormon think that because the locals don't call the valley and river by the name that Lehi gave them in the Book of Mormon that the book must be false. But why would the locals ever call the valley and the river by Lehi's name for them? Everyone who was present when Lehi named them travelled with him to the Americas. It was probably not in Lehi's best interest to leave a tour guide behind. And this completely ignores translation variations of names from one language to another. Even if Lehi did leave a tour guide around to tell the Babylonians where they went, the names wouldn't be rendered as Laman and Lemuel in our modern day maps. For example let's look at the Israeli settlement in the West Bank called Matityahu. It's found at LAT/LONG 31.929722, 35.034444 on a map. You may have to zoom in to find it. Why did I pick that city that's clearly rendered as Matityahu on the map? Simply because of the way the name translates into English. In English that same name is Mathew. Why is geography even included in the Book of Mormon? This also begs the question of why such specific geographic information is included in the Book of Mormon. The inclusion of geographic data is not necessary for the Book of Mormon to make its spiritual point. If the work was a fictional account that someone was trying to pass off as authentic history why would they add such detailed information about a journey made to a new world? What's the point? It stands in the author's best interest to make the journey as vague as possible to allow for a wide interpretation of locales. Instead, this work provides geographic details, times of travel and even names of existing, already named places. If you look closely at a map of Saudi Arabia you will notice that the canyon's name is listed as Tayyib al Ism. However, if you are really observant you will notice that it's not the only place that has that same name. As a matter of fact, it's used all over the place. From what I understand it comes from those who were exploring and mapping the area asking the locals what the names of the features were. The locals would tell them "Tayyib al Ism" and the explorer would record it as such. The translation literally means "That's a good name." 1 Nephi 2:4-8 - Found on page 7 starting at the last paragraph of the page. 1 Nephi 2:14 - Found on page 8 at the bottom of the page; just above the last paragraph.